As part of #patternmagicparty Week 3, I’m going to show you a simple technique you can use to create complex patterns. 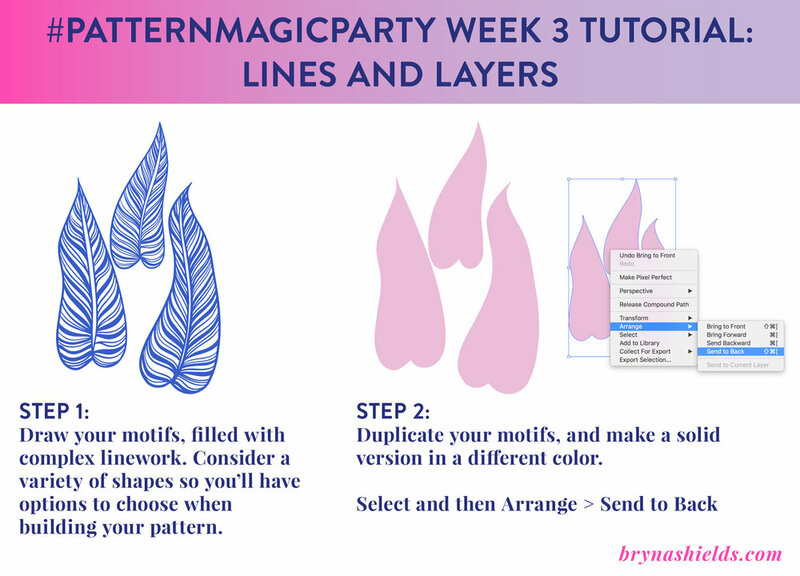 #patternmagicparty is a free weekly challenge for people interested in enhancing their surface pattern design skills. Join the party here, and invite your friends! Last week I was a Featured Designer on the Pattern Observer blog. I was honored to get the chance to write a bit about my current art practice, and the inspiration for one of my latest pattern collections, Nocturne (Psst! It's available for licensing! Please contact me for access to my client page). You can view the full article here. Happy Monday, friends! Now that I'm back to freelancing full time again, I've been craving this structure again. Creating artwork for others is fulfilling in its own way, but sometimes can leave you scratching your head for things to create on your own time. Three days in to this project, I've already found this second round of the 100 Day Project to be a tiny sliver of salvation in a hectic day. This time around, I'm doing 100 days of blind contour drawings. I've been thinking a lot about how we as artists present ourselves to the public. Social media has proven to be a great new way to connect artists with their audience, but it has also encouraged a very cleaned up, beautiful and "perfect" glimpse of what it's really like to be a working artist. We post only our best work, leaving behind all of the crappy sketches it took us to get to that point. I'll admit I was a little nervous choosing blind contour drawings for this next round of the 100 Day Project. By its very nature, blind contour drawings are very raw, imperfect and weird. That is exactly what I love about them, but I'd be lying if I said I didn't worry that it might make others question my validity as an artist. Would people get what I was trying to do? Would they think I was a total sham, completely untalented? Although it made me nervous, this was the very reason I decided to do it despite my doubts. My hope is that it will contribute to a new direction in social media, where we show the more raw parts of our process, the parts the make us question ourselves and our talents. All (or at least some) of the failed attempts, or unpretty things it takes to really be a working artist. How do you feel about this idea? I'd love to hear your thoughts! Friends, I've been revamping my newsletter, which sadly hasn't seen much action in the last few months. But, as my business grows and changes, I've decided to re-incorporate an email newsletter into the mix. If you sign up, you'll receive sneak peaks, sketches, announcements on new projects, exclusive discounts and more about 1-2 times a month. My hope is this will create another avenue of deeper connection amongst you all. How does that sound? Here's a free coloring page to get you through the rest of your week. Coloring can be such a stress relief! You can download yours here. I'd love to see what you come up with - share your finished page on social media with the hashtag #highfivesforcoloringbooks. Happy Monday, friends! I thought I'd try out an idea: to share a collection of interesting podcasts that I've listened to while working on art. My main rule for sharing is just that they have to be thought provoking or alter my perspective in some way. If you listen to any of them, I'd love to hear your thoughts! Admittedly, I was a little skeptical of listening to this episode, because I'd only known about 'conscious uncoupling' from all those gossip articles about Gwyneth Paltrow. But, this episode presents some really interesting ideas about how to approach and view relationships and breakups in a refreshing way. I don't think this episode is just for people going through a breakup, but I think we can all benefit from the perspective illustrated here. This is a really entertaining talk about a guy who decided to actually respond to one of those emails that promises to make you rich. A fun and lighthearted story, that I found to be a great reminder to have fun with your curiosities. I loved hearing Kate talk about how her life evolved as an illustrator and her philosophy as an educator. It was really fascinating to hear her walk through the thought process behind one of her highly personal projects, Daily Purchase Drawings.